Punjab FCI Admit Card 2019: In the recent updates, FCI Punjab Authority has withdrawn the recruitment of Watchmen 860 posts that released in the 2017 Year. Hence, Punjab FCI Admit Card 2019 can’t be expected to release for this notification. Candidates who were looking to get latest details about FCI Punjab Watchman Admit Card, Syllabus and Exam Date information are very disappointed this time. 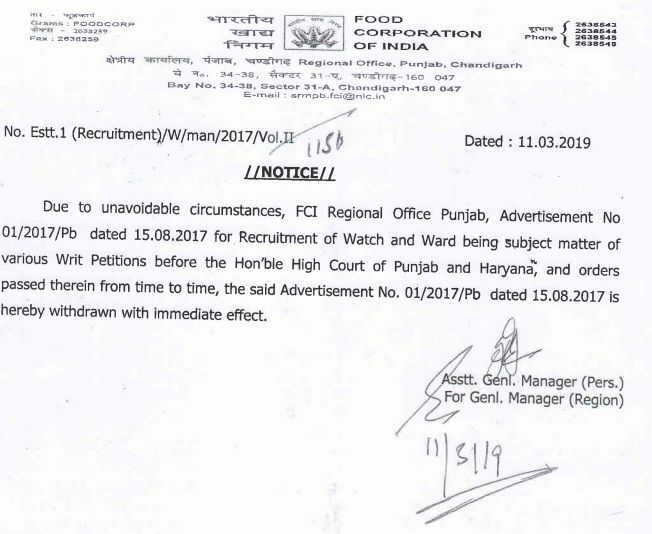 FCI Punjab had announced to put the recruitment of Watchman on hold until the further notice is released, as stated in the early notification. The exam scheduled to be held in December 2017 was postponed earlier as per the High Court’s Stay Order. As per the official update released, The Notification No. 01/2017-Cat.IV, Watchman/Security Guard/Chowkidar Recruitment on 860 unoccupied vacancies, under Punjab Regional Office, is withdrawn by “The Food Corporation of India”. An online mode of applications for Category-IV Bharti had been endorsed up and until September 2017. But the problem comes around is when the FCI Punjab, authority is not even bothered about releasing any schedule of examinations. The applied ones are under too much anxiety & frustration which has made them helpless now. Eligible candidates with the Middle (8th) Standard Qualification really have to perform in Written test & Physical Endurance Test (PET) as per the Punjab FCI’s selection process follows. PET is of qualifying nature but however, it will not be conducted for PH/PWD candidates as announced in the notification. Their final result will be prepared only on the basis of marks obtained in the written test. Question Paper for written test will be set trilingual i.e. English, Hindi, Punjabi. 1 question = 1 mark. And no negative marking for wrong answers. Grab this PDF File for detailed syllabus here. A common ratio 1:3 will be followed to shortlist the candidates for PET. And the venue details will be shared through the web portal of Punjab FCI. Complete selection scheme for the Written & P.E.T is available now. The benchmark to qualify in the written exam will be 40% for all other candidates except the erstwhile contractual Security Guards who earlier worked with FCI prior to 22.08.2002 and also securing the mandatory documentation as explained in the notification here. They should be treated qualified for achieving 30% marks. All the candidates need to mark their Name, Roll Number, DOB, Application Number etc. accurately on the OMR Answer sheet by using Blue/Black Pen. Individuals will also require signing their names on the Answer Sheets in the appropriate boxes. If any answer sheet has not filled in with required particulars, it will not even go for the evaluation. If a reserved category candidate has not properly indicated his category then it will be considered him belonging to UR category. Instructions mentioned in the e-admit card and answer booklet must be patiently gone through before the examination. To managing the Food Security system in various FCI Godowns of Punjab State, the department is looking out to recruit healthy and efficient Watchmen. Associated information about the upcoming examination schedule has been written in the above content. The Roll Numbers and call letters for the screening test will be uploaded only on the official website www.fcipunjabapply.com. Hence, Visit only the Official Website for your Roll no. For those who experience any trouble in downloading their FCI Punjab Watchman Admit Card, 2018 can write an email at [email protected], at least 1 (one) week before the test’s date. Note: Kindly contact AGM (Personnel), FCI, Regional Office, Bays No 34-38, Sector 31/A Chandigarh, in case the hall ticket is not being generated online. Mr. Kumar, Admit Cards and Exam Date for Punjab FCI shall be uploaded within a week. Kindly stay connected, you will be informed through the same page. Thanks for reaching us. Punjab fci watchman Exam, Will it be taken or not? Fci punjab da new paper Roll number kado tank aawega? Sir When FCI Punjab Exam Date is gonna come out? Eis baar cancel hai exam of fci watchman 2017 ..abi nortifiction aaya hain. Exam ka notification email id pe jaroor bhejiyega sir.please! Hoping to see an exam chart soon in the current month. Stay connected, you will be informed through this page. Recruitment stands on hold, please wait for the further notice. It will be held soon after the release of exam date. Stay tuned, Mr. Dhuri. Sir fci watchman exam ke admit card next week tak aaa jyege Kya plzzz reply me.. When admit card show tell me? FCI karnataka PET/Documentation verification kab hoga. Please give me information. Sir ye exam December m hi hota hoga? Re exam KB hoga Sir …..
My DOB is 18/09/1997 name Sachin. we can expect it to be held soon after the stay orders are removed. It surely will, Please wait until the next announcement. Please wait for the removal of court’s order. Check more info in the latest news above. PLEASE SIR FCI KI EXAM DATE KAB HAI PLEASE BATADO? Sorry, Can’t give you any date right now as the high court has announced a stay order on it. Kab aayega fci admit card? Sir fci ki new date kab tak ayegi? Mr. Gola, Information has been updated in the latest news section of the article above. Please refer to it. Hi Mr. Saurabh. I will advise you to go through this article once. An update has been published already. Thanks for reaching us. exam kab tak Hoga Kuch bataye sir? Sir punjab fci ka exam kb hoga? Sir punjab ka kb ayega roll no g fci ke g daeo sr please? Sir fci punjab ka admit card kab se download honge please inform me, sir? sir exam ka date kab aane wala hai . Kitna inthjar karna pade ga..jaane ye govt. kis soch me pad gayi hai. Sir please bataiye na ki Punjab FCI ka exam date kab tak aayegi. Sir Punjab FCI new exam tell me I’m worried so plz tell me sir. Sir April Me Exam Hoga ya nahi. Sir Punjab FCI ka watchman exam shayad April me hoga. Vaise Kya sarkar ne FCI Punjab ki vacancies Dobara release kar diya sir. Dear, it is expected that this exam will be conducted before the 2019 Elections.